No matter how big, expensive or complicated a movie might get, it's still everyday people making it - which means a ton of mistakes, errors, or oversights in even the biggest box office hits. Nobody's perfect, but you'll be amazed to find out just how many mistakes fans are willing to ignore - or never even catch in the first place. Here are Screen Rant's 20 Incredible Mistakes That Made It Into Disney's Frozen. The ice saws in the opening number are used properly, but it would be impossible to begin the act by stabbing directly through ice that thick. In the real world, a hole is drilled beforehand, so the blade can work as a saw, not a sword. The shadows cast by Anna and Hans during their dance sequence atop the lighthouse are fine, but the fact that their silhouettes are hovering in midair... isn't. When Elsa decides to "Let it Go" and let her hair down once and for all, she does so by letting her braid tumble down her back. But instead of pulling her braid over her shoulder from behind, she teleports the braid directly through her shoulder, revealing a truly mind-bending animation mistake. When Anna sets out to track down Elsa, her horse decides that a snowy mountain isn't its cup of tea. Anna goes on foot, tumbling down a slope into an icy stream, which freezes her dress solid. But having already seen a fountain frozen in place by Elsa when she makes her escape, and the same motionless ice in a waterfall when paired with Kristoff, there's no reason why the stream should still be flowing. Aside from the snow, the winter that Elsa brings to Arendelle is a relatively calm one. But that doesn't stop the door of Wandering Oaken's Trading Post (and Sauna!) from being violently slammed shut after Anna enters - or Kristoff covered head to toe, with the sound of him walking in out of a raging blizzard. Kristoff's guitar clearly has four strings, but only three tuning pegs. If that weren't bad enough, his song informs the audience that "reindeers are better than people." But having spent his entire life with the four-legged friends, Kristoff (or the writers) should know that the plural of reindeer is reindeer - not reindeers. Elsa's not the only magic user in the movie, since Kristoff's sleigh has enough room for he and Anna to share comfortably. But when she makes a point of moving to the edge of her seat, the next shot puts her back at his side, packed in closer than ever. Kristoff and Anna are heading towards the North Mountain (where Elsa's castle is located), when she briefly stops to look back at Arendelle. Once the camera flips to show her gazing into the distance, they set back off. But the North Mountain they've been heading toward should now be to their right - instead, it's now revealed to be back to the left of screen, the exact same direction there were coming from in the previous shot. When Anna and Kristoff run into Olaf - literally - he winds up with his head turned upside down. His view of the two characters should therefore have their positions reversed (with Kristoff and Sven on the right, and Anna flipped to the left), but they're on the same sides as the shot before. 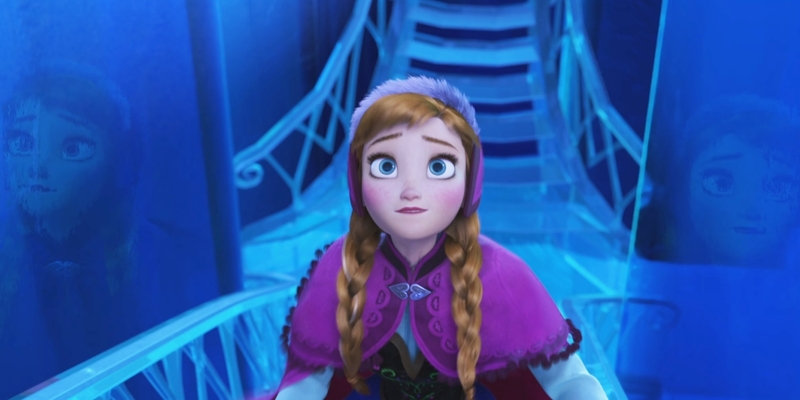 When Anna is ascending the staircase of Elsa's ice palace, the columns on each side reflect her face. But the reflection is the same angle towards the camera - the front of her face - not a view from the side, which they should. The animators apparently forgot about Anna's hat when she and Kristoff slide out of Elsa's castle, since it disappears while they're being removed, but magically reappears in the next shot. Anna makes the right call in cutting herself and Kristoff loose, but they're still tied to one another - until they land, and the rope is gone. Hans charges Queen Elsa with treason while acting as regent, even though most monarchs can't actually be charged with treason against the state, since they ARE the state. But his entire plan was a bust, since the husband of a queen doesn't become king if the queen dies. When the guards come to execute Queen Elsa, they discover she's frozen her way out of her shackles. The problem is that hot metal bends - cold metal would shatter instead. Kristoff and Sven leave a trail of footprints when they leave Anna behind, but when turning back for their rescue, the snow hasn't even been touched. When we first see Queen Elsa's study, her double doors fittingly open onto the end of a long hall. But when Anna is later locked in the same room, the double doors now open onto a wall, in the middle of a long hallway. When Anna saves her sister's life, the power knocks Hans unconscious, sliding behind a block of ice a few feet away - that is completely missing just seconds later. Apparently Hans wields a magical sword, since it appears and disappears throughout the movie, including when he draws it from a make believe sheath in the final act. Even Disney makes mistakes, including Kristoff's thumb passing though Anna's digital clothing for a split second. There you have it: every mistake, error, or inconsistency in Disney's Frozen. We've kept our list to only the mistakes that are impossible to dispute, and we think fans would agree that they're easy to forgive - even if we have to spot each and every one of them during our next viewing. Did we miss any of your favorite slip-ups? Let us know in the comments (and maybe what other movies we should put under the microscope), and remember to subscribe to our YouTube channel for more videos like this one.